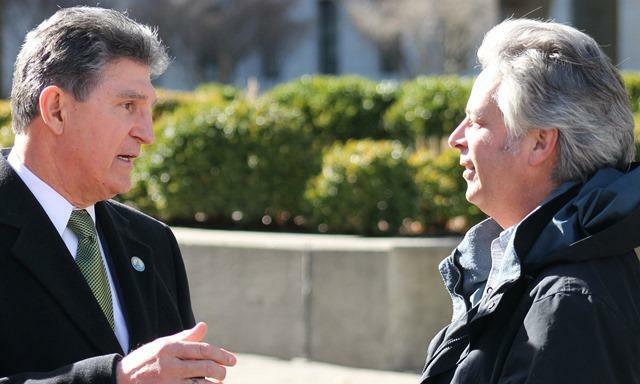 Charleston Gazette-Mail reporter Eric Eyre (right) interviews W.Va. Sen. Joe Manchin. Manchin fought to reclassify hydrocodone from a Schedule III to a Schedule II controlled substance. Drug wholesalers sent 780 million hydrocodone and oxycodone pills into West Virginia over six years, according to an investigation by the Charleston Gazette-Mail. Meanwhile, 1,728 West Virginians died from overdoses of these two powerful painkillers. Who let it happen? Investigative reporter Eric Eyre, of the Charleston Gazette-Mail, answered our questions about his series on The Front Porch. 1. What was the biggest surprise for you? Drug wholesalers shipped enough painkillers to provide 433 pills for every man, woman and child in the state, Eyre said. And in parts of the southern West Virginia coalfields, the numbers were even higher. “I was surprised that some of the smallest pharmacies had some of the biggest numbers,” Eyre said. For example, nearly 9 million hydrocodone pills to one pharmacy in Kermit, W.Va., population 392. 2. Did the drug wholesalers do anything illegal? “They have a legal obligation to report these suspicious orders to the (federal) Drug Enforcement Agency,” and to the state Board of Pharmacy, Eyre said. For years, none of them did. But after a lawsuit was filed by former state Attorney General Darrell McGraw, some wholesalers began to send suspicious order reports to the Board of Pharmacy. 3. What did the Board of Pharmacy do with those reports of suspicious orders from the drug wholesalers? They put them in a box, Eyre said. They did not tell law enforcement or even tally the information on a computer. Now, the board is considering sharing these with the State Police or Attorney General. 4. How do the drug wholesalers defend themselves? “They say these are licensed pharmacies. These are licensed doctors. The responsibility should be with the boards that licensed those two groups,” Eyre said. 5. This investigation looked at the time period of 2007 – 2012. What’s happened since then? On many levels, there’s been a crackdown on illegal use of prescription opioids, Eyre said. Hydrocodone was reclassified to make it harder to prescribe. State officials are tracking prescriptions more closely. The number of overdoses from hydrocodone and oxycodone have leveled out and maybe declined a bit. But they’re being replaced by drugs like heroin and fentanyl. 6. What’s the relationship the flood of pain pills and today’s heroin epidemic? “The pain pills set the stage,” Eyre said, for illegal drugs like heroin and more powerful synthetic opioids like fentanyl. Now, those drugs are causing more and more overdoses. 7. What’s been the reaction to your story? “Since this article came out, I have gotten emails from all over the country, saying they had an overdose in the family," Eyre said. 8. What’s the historical context? Front Porch co-host Rick Wilson says, “It reminds me of the Opium Wars, in which Great Britain went to war with China to have a free market in drugs." 9. How did this even happen? “When there’s a drug epidemic in a poor community, it’s not that big a deal. But when it crosses over to affect middle and upper class people, it’s a tragedy,” Wilson said. 10. What Bible verse best sums up the lessons from this series? "The Front Porch” is a place where we tackle the tough issues facing West Virginia and Appalachia with some of the region's most interesting thinkers. WVPB Executive Director Scott Finn serves as host and provocateur, joined by Laurie Lin, a conservative lawyer and columnist, and Rick Wilson, a liberal columnist and avid goat herder who works for the American Friends Service Committee. Two West Virginia health centers are getting help with their fight against opioid overdoses. Senators Shelley Moore Capito and Joe Manchin announced Friday that two West Virginia health centers will receive a total of $200,000 from the U.S. Department of Health and Human Services for the Rural Opioid Overdose Reversal Grant Program.